A special command lets you execute a macro on each line in a region. How frequently do you encounter an email with text that you want to yank, but that is quoted several indentation levels? Of course, we can think of several ways to delete the indentation quickly, but a line-oriented macro is a quick approach too. You define the macro and execute it on a region by typing C-x C-k r (for apply-macro-to-region-lines). Remember that earlier we said that macros should set themselves up to repeat? This command is different because it expects to work on one line at a time. You don't want to set it up to repeat by moving to the next line; it does that automatically. Table 6-5 shows a quick line-oriented macro that deletes indentation marks from text quoted in an email or newsgroup message. F3 Start the macro definition. C-a Move to the beginning of the line. M-f Move forward one word. M-b Move to the beginning of this word. C-w Delete the extraneous indentation characters. F4 End the macro definition. 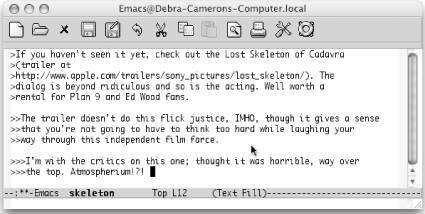 Text indented at various levels (Mac OS X). Indentation is deleted (Mac OS X).